Well, Beth Moore is once again the target of her fellow Christians. This time, she has offended Believers with her comments about Bible Study. Here's what she said: "Spending time with God and spending time with the Bible are not the same thing. The Bible is the Word of God, crucial to knowing Him, but it's not God. We can study our Bibles till the Second Coming and leave God completely out of it. We can grow in facts and never grow a whit in faith". To begin, I would venture to say that sometimes we Christians react hastily to comments such as this, without first trying to understand the central point that is being made. Secondly, I would also say that we Christians often times don't clarify the point we are trying to make, and can confuse those we are trying to reach. I have been guilty on both counts. But let me tell you what I believe Beth Moore's comprehensive position is and why I agree with her. I think most people reading her statement got stuck on the first sentence, and never went any further in trying to determine the point she was attempting to make. And I have to say that I can see why -- when I am spending time with the Bible, I feel I am hearing from God, so my time is well-spent. But I do not think that I am receiving the fullness of God just by reading the Bible. In other words, I am encountering Him in part through acquiring history of Him, His Nature and His Character -- an intellectual comprehension of who God is. But there is a supernatural empowerment that comes when the Holy Spirit inspires us in the Word. I believe that is what Beth Moore was trying to articulate. Let me see if I can explain it this way.... Someone reading the Bible without the inspiration of the Holy Spirit is able to capture the meaning of the written word and understand it according to the human mind. But someone reading the Bible under the inspiration of the Spirit is captured by the Word and is activated to apply it to his or her life. See the difference? In the first instance we are doing the capturing; in the second it is the Word capturing us through the Spirit. Where we Christians are coming into so much conflict is when we limit the empowerment of the Word in our study. And I think it is this "middle ground" that Beth Moore was trying to address. You see, our human understanding of the Word is veiled without the Holy Spirit. It is possible that sin [which is inherent in every human being] can get in the way of our mind's discernment. And because we tend to let our religious traditions and group opinion within our denominations determine our interpretation of the Bible, we oftentimes ignore what the Holy Spirit is trying to illuminate in a passage. Beth Moore is not trying to devalue Bible Study nor say that God is not speaking to us when we study the Bible. I believe she is trying to say that time spent studying the Bible without the illuminating and empowering presence of the Holy Spirit is leaving an important aspect of God out of the equation. The bigger question she is posing is this: What is the role of the Holy Spirit in Biblical interpretation, and do we allow Him to reveal His Truth? If we realize that the Holy Spirit is the "breath of God", breathing life into our souls and spirits, then we can see His importance in comprehending the Bible. The Bible is the written Word of God, and words are spoken with the use of breath. 2 Timothy 3:16-17 reads, Every Scripture is God-breathed (given by His inspiration) and profitable for instruction, for reproof and conviction of sin, for correction of error and discipline in obedience, [and] for training in righteousness (in holy living, in conformity to God’s will in thought, purpose, and action), So that the man of God may be complete and proficient, well fitted and thoroughly equipped for every good work. The Passion Translation actually says, Every Scripture has been written by the Holy Spirit, the breath of God. The rest of that passage articulates that "It will empower you ... to fulfill any assignment God gives you". The Holy Spirit does not try to give a new meaning to the Word of the Bible through how we personally relate to it, but instead, shines His Light into the Word that He wrote so that we can more fully comprehend it. It is His Light, not our minds or religious traditions that determine the Truth of the Bible! I will finish by commenting on Beth Moore's last sentence .... "We can grow in facts and never grow a whit in faith". And I think this is the point on which I agree the most. We can study the Bible and accumulate mountains of information about faith -- but never be empowered in and by faith to act for God's purpose. But if we do as Jesus commanded ... "Have faith in God", we can actually move mountains. Faith is not just knowing, but doing. And it is the Holy Spirit that empowers us to do. I believer the Apostle Paul expressed the heart of Beth Moore's argument when he wrote, "so that your faith might not rest in the wisdom of men but in the power of God". We are sometimes guilty of studying the Bible without inviting the presence of the power of God [the Holy Spirit]. I'm sorry, but I believe that to be true! I will grant that Beth Moore's words were controversial and subject to different interpretations. 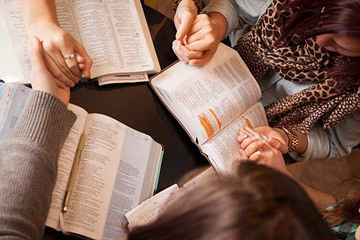 But she made her position quite clear when she followed up her original remarks with the following statement: "... People who study the Scriptures constantly and are continually mean-spirited, rude, slanderous and aside [of] their religious rhetoric, bereft of outward evidences of the Holy Spirit are having Bible study without God. He affects us." Perhaps it is time that we, the Body of Christ, examine ourselves. Are we being impacted by outward evidences of the power of God when we study the Bible? Are we allowing the breath of God to move us from continuing in our man-made religious traditions to acting in faith from God's perspective? Are we allowing the Holy Spirit to show us the meaning of our study, or are we relying on, as Paul says, "the wisdom of men"? If not, then we are studying from our human intellect. Don't you want to know and understand the things of God from a personal, active, and empowered basis? I know I do. And I know that I can only apply the Word of God in my life with the help of the Holy Spirit. So, I was not offended by Beth Moore's comments. Not at all. It only made me more determined to seek the Spirit's help whenever I sit down to study. Bible study without God is not an option. 1 Corinthians 2:14 "Someone living on an entirely human level rejects the revelations of God’s Spirit, for they make no sense to him. He can’t understand the revelations of the Spirit because they are only discovered by the illumination of the Spirit".